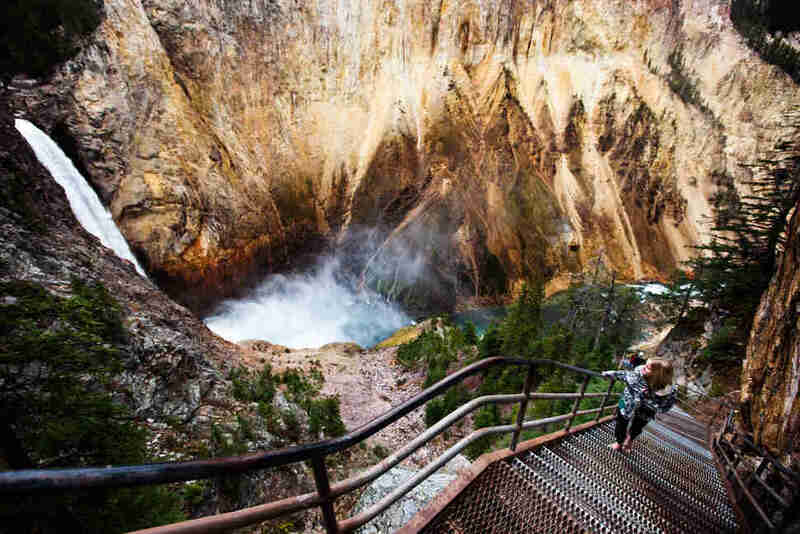 If the National Parks Service was the best idea America ever had, then Yellowstone -- the first national park not only in the US but in the world -- is its crowning achievement. Larger than Delaware and Rhode Island combined, the park spans three different states (Wyoming, Montana, and Idaho, but mostly Wyoming), is home to 67 species of mammals, 290 waterfalls, 1,800 archaeological sites, and, as you may or may not remember from the doomsday movie 2012, sits atop an active volcano. 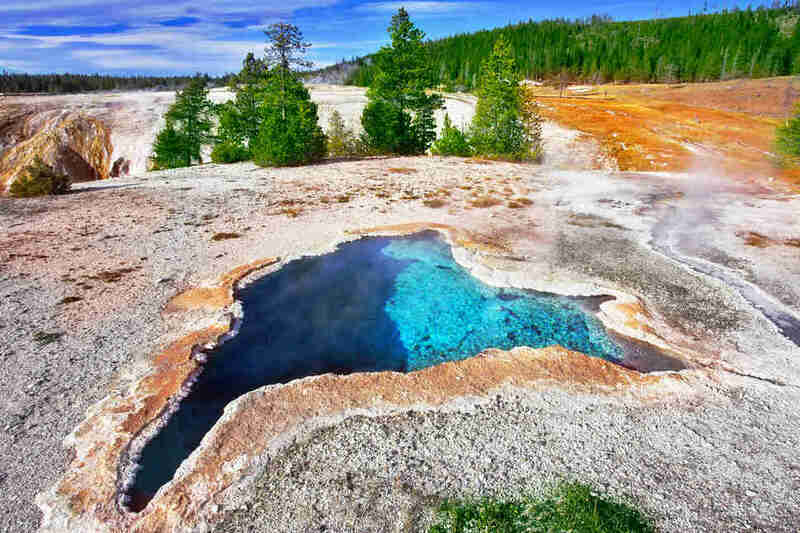 Yellowstone is sublime, beautiful, and, at times, deadly -- just ask the guy who literally dissolved in boiling acid after falling into Norris Geyser Basin. That doesn’t deter millions of visitors from making the journey each year. Some of those are experienced backcountry campers, adventure types who come for the park’s best trails, or seasoned fishermen eager to get their hands on the cutthroat trout. But most visitors would like to do… a little less. Whether you have small kids, an outsized fear or bears, a physical disability (you can check the park’s breakdown of disability access here), or just a general disinterest in slogging through any potential cold, mud, or insects to see what you came to see, Yellowstone has still got you covered. Here follow some of the park's most magnificent sights and attractions… all of which you can see without really leaving your car. In the past 2 million years, the region has seen three major volcanic eruptions from the Yellowstone Caldera. 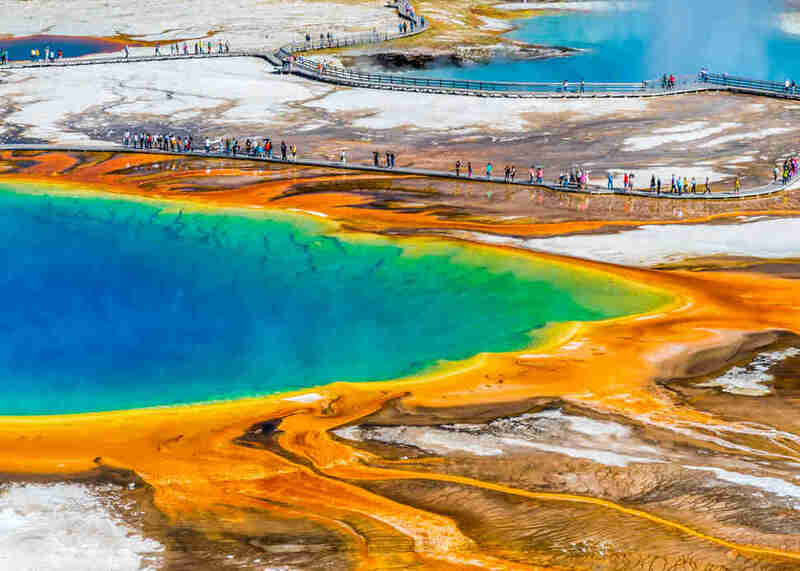 And while scientists don’t believe Yellowstone is due for another eruption anytime soon, it’s the magic of the volcanic, seismic, and hydrothermal activity happening underground that makes the park special. 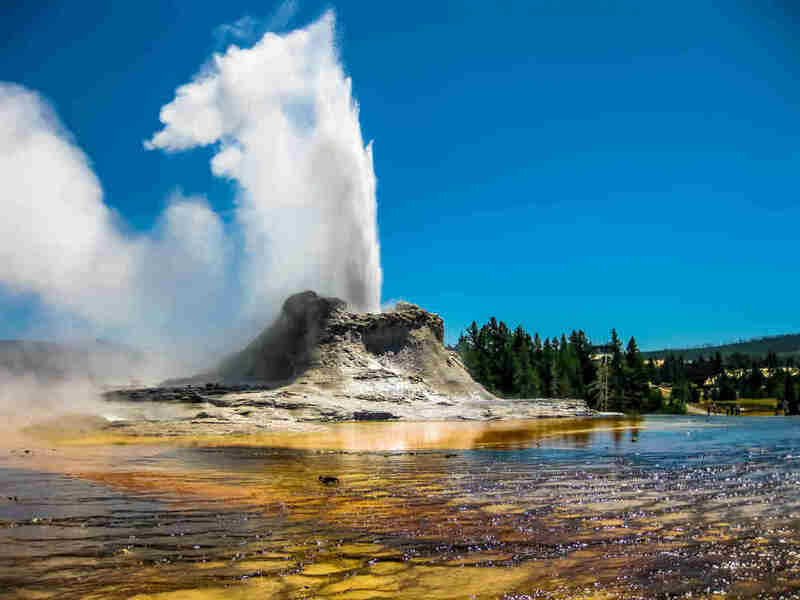 Castle is a cone geyser -- the largest in Yellowstone -- known to erupt every 10 to 12 hours, reaching up to 90 feet in the air and lasting around 20 minutes. It’s notable for its intensely loud sounds created by the pressure of the water transforming into steam, and it’s pretty conveniently located in the Old Faithful Basin area (which you were 100% going to visit anyway). Grand Prismatic is the largest hot spring in the United States -- we’re talking bigger than a football field -- and the third-largest in the world. It’s like something out of a JJ Abrams film. The brightly colored rings around the pool get their striking, oversaturated, unnatural-looking hue from heat-loving bacteria; the piercing blue middle is created by extreme temperatures that sterilize the H2O. You can park your car nearby and easily view the spring via a handicap-accessible boardwalk. Looking for America’s biggest body of water over 7,000 feet above sea level? Or North America’s largest population of wild cutthroat trout, perhaps? 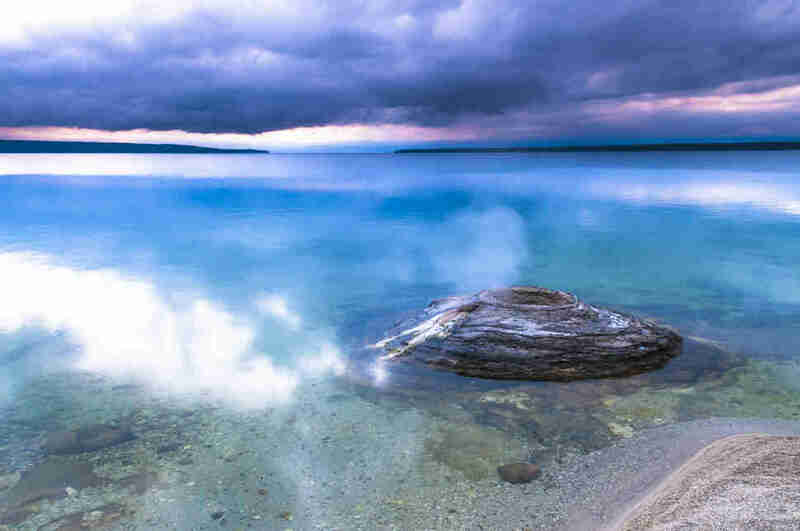 Yellowstone Lake is your jam on both counts. With an impressive surface area of 132 square miles, what’s truly badass about this lake is what’s underneath. Researchers believe that the bottom is covered with geysers, hot springs, and canyons, and contains ecosystems similar to those found near heat sources in the Pacific Ocean. Take a walk along the sand spit near Bridge Bay if you’re looking to stretch a bit, and come late afternoon set up some chairs facing east to catch a reverse sunset -- watching the shadows descend over the mountains while the sun sets behind you. If you drive east from Fishing Bridge you’ll almost think you’re at the beach, what with the waves lapping at the shoreline. 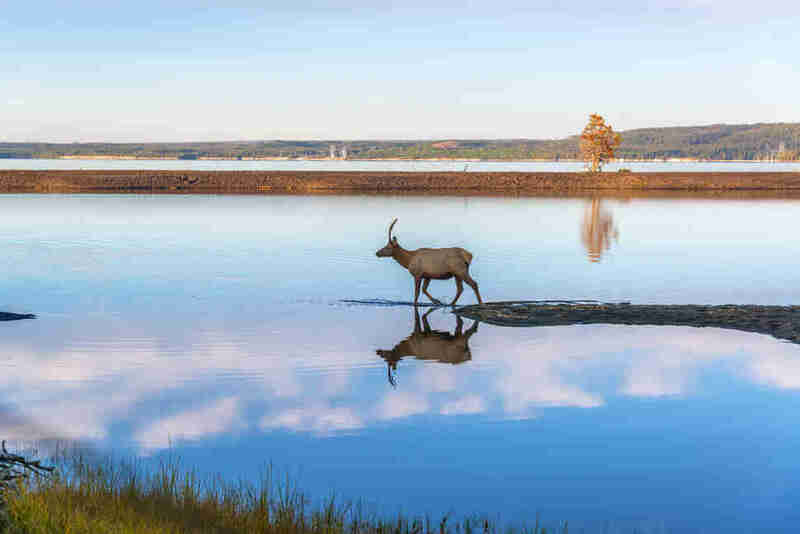 When you reach Sylvan Lake, park, maybe take out a picnic, or fishing gear if that’s your thing. No need to go farther, though, since there’s not much else to see between there and the east entrance. 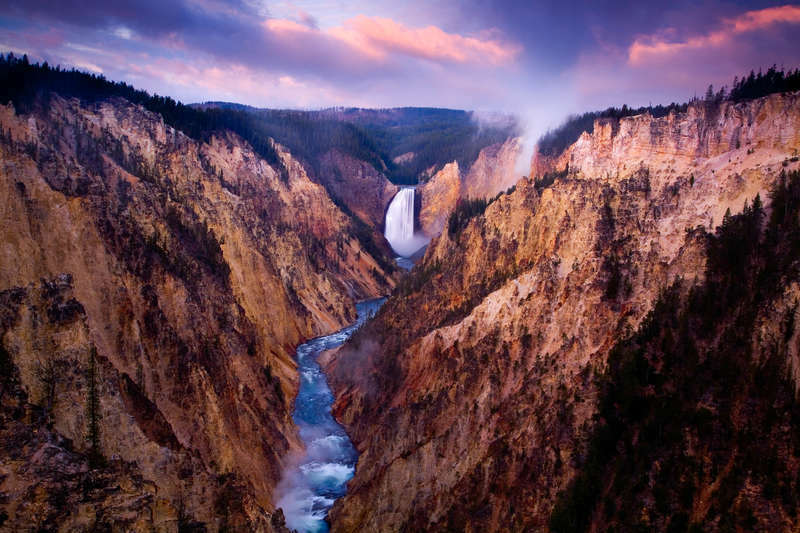 At a youthful 10,000 to 14,000 years old, the Grand Canyon on the Yellowstone River is considered one of the “newer” additions to the park. Formed by eons of erosion, it’s nearly 20 miles long and as wide as 4,000 feet across. 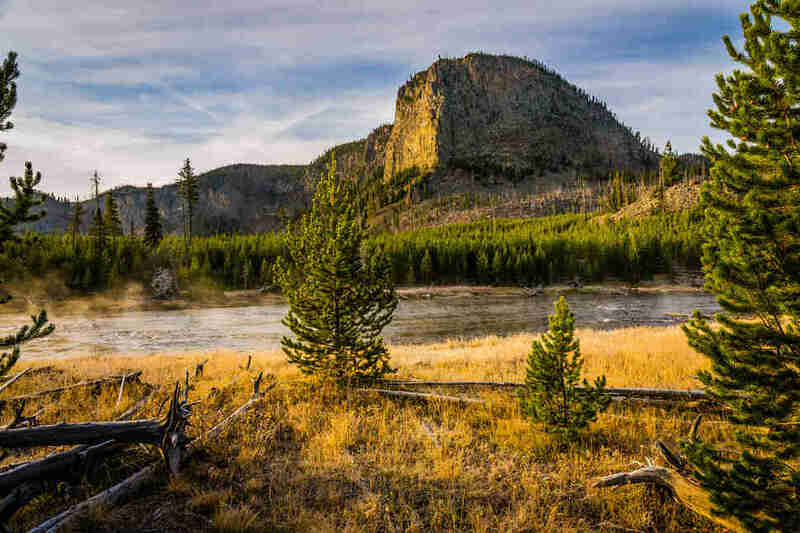 You’ll find some of Yellowstone’s most popular hiking trails in the park here, but you can also just park at the Canyon Visitor Education Center and take in the views from the scenic overlooks. Another treasure nestled in the Old Faithful Basin area (meaning you can park at the same place you did for Castle Geyser), Blue Star is a turquoise-blue spring that’s usually sitting right at boiling temperature. Considered the most beautiful spring in the entire park, Blue Star was literally used as a trash can by visitors until it was cleaned up in 1946. Looking closely at the pool, it’s sometimes possible to see the bones of a young bison who, RIP, fell into the water in 1996. Bison have called this area home since prehistoric times. 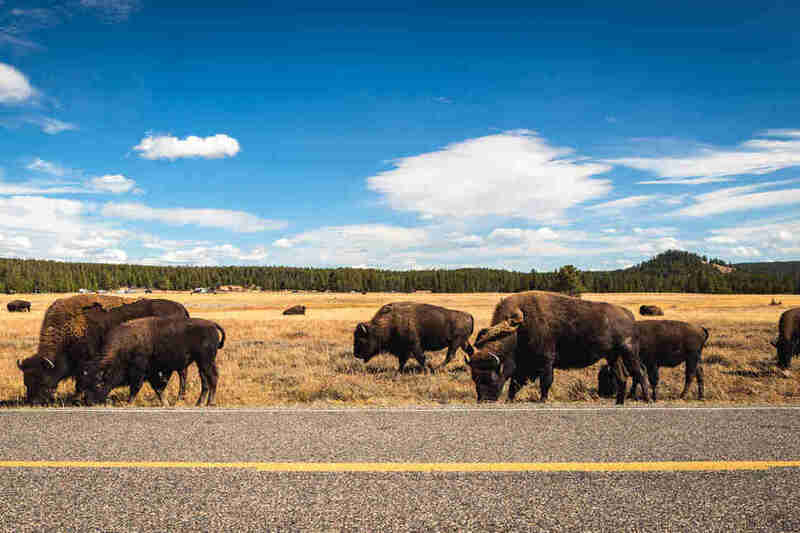 After being hunted to near-extinction in the 19th century, there are now over 5,000 bison thriving in Yellowstone. Don’t worry too much about finding them -- drive around the park for more than a day and it’s pretty inevitable that they’ll just sort of happen upon you. Hayden Valley, clear of trees on either side of the road, is probably the best place in Yellowstone to pull over and see what you can see (bison; it will be bison), assuming they aren’t already blocking the road. Come at dawn and dusk to maximize your wildlife-spotting odds. 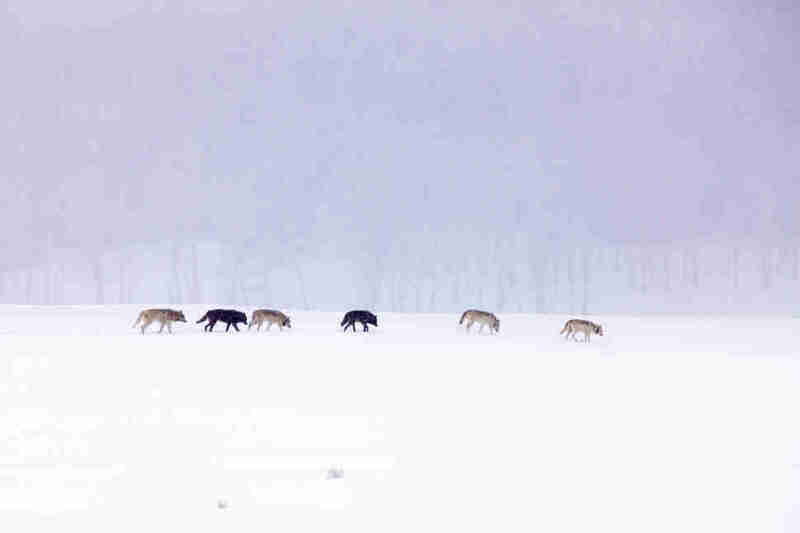 Hayden Valley is also one of the top spots to look for wolves, especially come wintertime. Chances are also good you’ll see elk, pronghorn antelope, and perhaps some deer. Remember, always keep your distance -- wolves won’t let you come too close, but bison will and can be aggressive (especially in the late summer, when the males are rutting). Plus they run as fast as 30 mph and have been known to commit a goring or two. 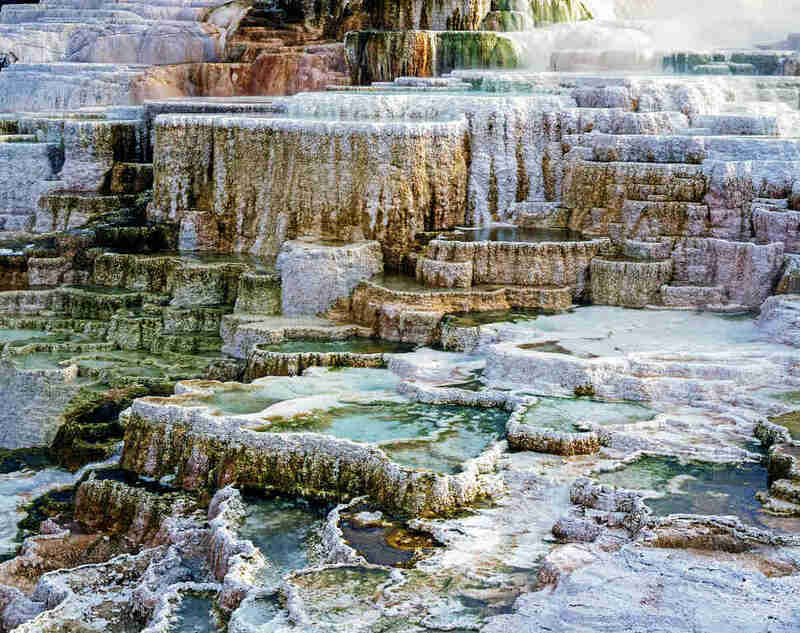 Made from limestone, thermal water, and a natural procession of chemical reactions, the Mammoth Hot Springs Terraces are an otherworldly series of icy travertine that cascade and flow like a fountain. A crowd favorite, Minerva Spring boasts a vast array of colors because of thermal-vent-loving bacteria living in the water. You’re pretty much guaranteed to see some elk wandering the lawns around the Mammoth visitor center -- they will truly not care about your presence one way or the other, but again, keep your distance -- so bookmark this as the park’s easiest place to see wildlife while expending literally no effort whatsoever. Come winter, the stretch of road between Mammoth and the park’s northeast entrance will be the only stretch that remains open. Fortunately, it takes you through the Lamar Valley, one of the best scenic drives in Yellowstone. Other than Hayden Valley, this is the best spot in the park for wolf spotting, and you’ll likely catch some frost-covered, steam-huffing bison -- one of Yellowstone’s most iconic images. Winter is also when elk, pronghorn, and mule deer tend to congregate in the upper part of the park near Mammoth, where it’s driest. Fishermen used to stand at Fishing Cone (sitting slightly offshore in the West Thumb Geyser Basin, but don’t worry -- only slightly) and cast their reels into Yellowstone Lake. When they caught a fish, they’d drop it on the hook into the fishing cone and cook it directly in the hot spring. Fishing here is now prohibited, since the cone is an active geyser with known eruptions back in 1919 and 1939, but it remains nice to look at. The original gangster of American geysers is usually the first stop for the park’s 4.2 million-plus visitors each year, and comes complete with wheelchair-accessible boardwalks. 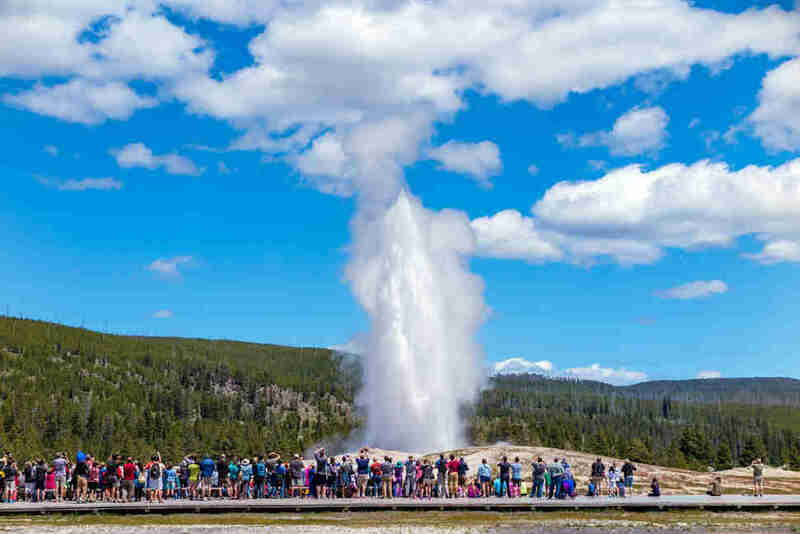 Discovered in 1870, Old Faithful was named for its almost clockwork eruptions of boiling water (between 3,700 and 8,400 gallons) that spew up to 180 feet in the air. These days, it erupts about every 94 minutes, plus or minus 10. You can check the eruption forecasts at the visitor center or on the Yellowstone app, if you happen to have Wi-Fi or a cell signal. You can also check the forecasts on @GeysersNPS on Twitter, but, again, internet. While it’s not the most incredible sight in the park, it is an American icon and you must see it. This stretch of road is unique in that there are so many picnic areas and scenic pullouts it’s almost like the main road has a second, more winding road running alongside it. The route(s) follows the Madison River, and so spectacular is the scenery that I kept merging back onto the main road only to abruptly pull over as soon as the next pullout appeared. Bring a picnic. Watch out for swans. Tanner Saunders is an Editorial Production Assistant at Thrillist who thinks Yellowstone is just swell. Follow his adventures on Instagram.